App Let’s Anyone Steal a Key to Your Home or Business! Want Someone Elses Key? Just Take a Picture of It. New apps will send you an exact copy of a key from a photo you send them. You may say, “So what?” Check out our chat below. Anyone can simply snap a picture of your home or business key and have it mailed directly to them. Voila! They are in your home or business. 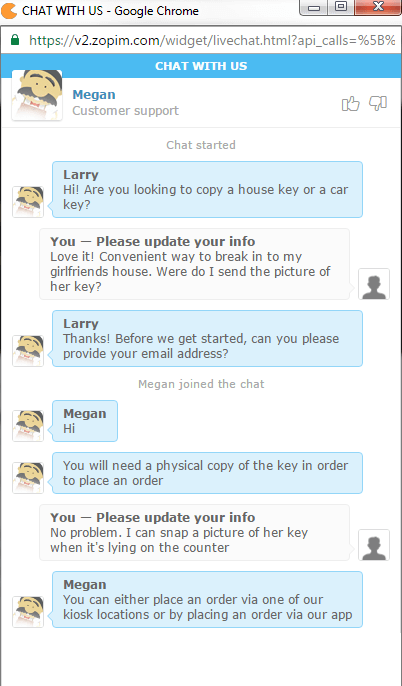 This company confirmed that they would send me a key of my girlfriends home from a picture so I could “break in” when she wasn’t home. Say you have your keys lying on the counter, or on your desk at work, or on a table while out at dinner. Who ever is with you, that new date from Tinder (who you know virtually nothing about), the slightly more than jealous ex-girl/boy friend that you’re trying to be just friends with, a frenemy from work/school, or a disgruntled employee just snaps a quick photo of that key. 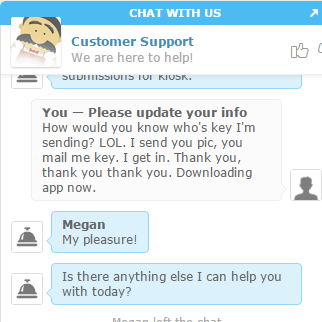 They send it to the app and an exact copy of your key is mailed to them. BOOM! They have a key to your home or your business. This is a gross violation of your safety! Why would they do this? Why would they risk it? They will also provide you the cuts to the key and say “take it to a locksmith to have the key made” for emergency situations. I can tell you. WE WILL NOT BE CUTTING KEYS FROM THIS APP. I don’t know who that key is for. I can’t verify you have access rights to the property from a photo. If I cut that key, I’m putting you at risk. ACME Locksmith will not do it. Shame on this company and other like them. The only way to stop this from happening for certain is to have you home placed on a keyway that is not available to these businesses. They can only perform this service for the most common keyways, not restricted keyways. Restricted keyways can only be copied by credible locksmith copies because they are not readily available. Short of that, keep your keys hidden. Relationships fall apart, employees leave, etc….Don’t leave your keys out so someone can snap a picture.